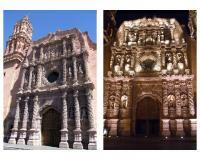 The Historic Centre of Zacatecas is a well-preserved Spanish colonial town based on mining industry. Many of its streets are steep or at different levels due to the mountainous setting. Zacatecas was founded 1548, two years after the nearby discovery of silver. This and other mines in the vicinity attracted a large population, and it soon became one of the chief mining centres of Mexico. Silver from Zacatecas and from Potosí in Bolivia was coined as pieces of eight and transported around the world by the Spanish treasure fleets and the Manila galleons. Its heyday was from the 16th to the 17th century, after that it was overtaken by Guanajuato. I recently visited Europe and was surprised by the similarities I have seen in Zacatecas. The streets in Rome reminded by of my walks in the city of Zacatecas. I can't wait to go back and visit the city again. 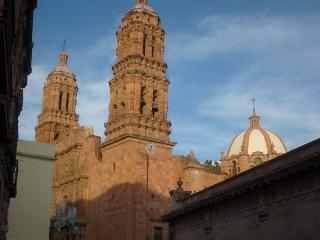 Zacatecas is beautiful. It feels as if you are in a Europe. Italy maybe? Absolutely wonderful. You can really feel the positive energy in the air. There is something about this city that makes you not want to leave.I think it's because there is a certain intimacy you feel with city. As a “colonial” centro historico Zacatecas has a number of similarities with Guanajuato – particularly its setting in a deep(ish) valley and its wealth from Silver. We visited it first and were quite impressed – until we saw Guanajauto! Michelin has it about right when it grants Guanajuato *** (worth a journey) and Zacatecas ** (worth a detour). With a population of about 130000 it is significantly larger then Guanajuato. Its valley is less confined and it has spread more with a surrounding and unattractive suburban area but the centre is pleasant and relaxed – albeit not traffic free. The city lies at an altitude of 8000ft – which you will feel if you do much walking! The cathedral (photo 1) is perhaps the only building which trumps Guanajuato’s offering with its magnificent “pinkish” façade - its floodlit appearance at night is particularly fine (photo 2). Beyond that there is the usual range of “niche” museums (covering, inter alia, Surrealist Art and Indigenous Masks), pleasant gardens, squares, colonial streets, mansions etc. We didn’t take the teleferico which, unlike Guanjuato’s funicular, actually crosses over the city from one side to the other – but then Zacatecas has no viewpoint quite like Pipila. An interesting “non-UNESCO” visit is to the Quinta Real Hotel built around Zacatecas’s bull ring – the (expensive for Mexico but not so much in European terms) restaurant is built into the seating tiers. It is at least worth going into.